This is recent Science Node article of mine. I’m still learning to be okay with an editor’s tweaks. My style is probably a little drier than his. Duke researchers use smartphones to paint a clearer picture of multiple sclerosis. Multiple sclerosis is a multifaceted neurological disorder that can perplex scientists. To fill in the gaps in their knowledge, researchers are now looking to mobile phone technology. In Multiple Sclerosis (MS), a condition that affects an estimated 2.3 million people worldwide, the body’s immune system attacks the central nervous system, interrupting and distorting impulses traveling between the brain and the body. MS symptoms can include fatigue, numbness and tingling, weakness, walking difficulties, bladder and bowel problems, and cognitive changes. Some less common symptoms are speech problems, tremors, breathing problems, headache, and seizures. MS symptoms vary and can be triggered by things like stress or temperature extremes. Because every person who has MS experiences it differently, it is difficult for scientists to grasp. 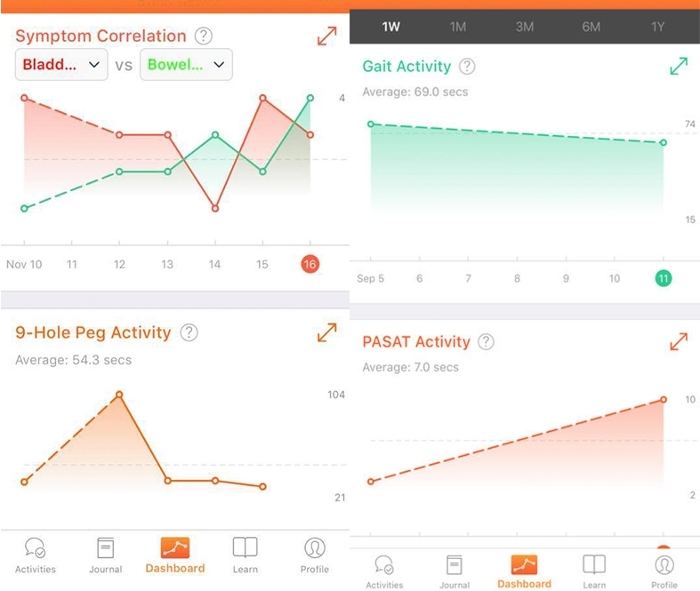 That’s one of the reasons F. Lee Hartsell and researchers at Duke University launched MS Mosaic, an iPhone app to gather data from MS patients. MS Mosaic will help researchers better understand how patients live with MS from day to day. Designed by Thread Research, MS Mosaic employs surveys and tasks to record and track MS symptoms. To get involved, participants download the app, sign up for an MS Mosaic account, and start answering health questions. Each day, the app will prompt users to rate the severity of 19 symptoms on a scale of zero to five. The app also asks if the user feels he or she is having a relapse. A relapse, also known as a flare-up or exacerbation, is marked by the occurrence of new symptoms or a worsening of existing symptoms. On some days, MS Mosaic assigns physical tasks to complete. One activity has participants walk 25 steps forward and back with the phone attached to the body to test the functionality of the walk. Another task is tapping the iPhone screen repeatedly to test fatigability, motor speed, and coordination. There is a test that involves adding a series of numbers, another that requires the person to move a virtual peg across the phone screen, and a game that tests short-term memory. Hartsell believes that AI will help the researchers identify related symptoms, and generate algorithms that can predict symptom changes. He hopes that as the data becomes larger, the app will be able to deliver personalized insights to users. MS Mosaic participants self report their MS symptoms and track their responsiveness to tests. Smartphone technology is helping MS researchers understand the variety of MS experiences. Courtesy MS Mosaic. Researchers also hope that insights gained from the Mosaic study will help customize symptom management and one day influence all MS care. One of the study’s goals is to understand why some people with MS experience different symptoms than others, and why symptoms can vary over time. The study is open to anyone 18 or older (with or without MS) who lives in the US and is comfortable reading English. There are currently around 300 people enrolled, and enrollment is increasing each week, Hartsell says. Hartsell is seeking to increase participation in this study and also to recruit members to the Mosaic research team. The MS Mosaic Artisans Project aims to assemble the skills of MS patients, care partners, researchers, and clinicians to share information in the areas of platform development, data science, disease education, and care improvement. If you would like to help or learn more about this study and find resources about Multiple Sclerosis, visit the MS Mosaic web site. There was a brief time when I would create monthly exhibits on my cubicle walls. It got to be too much trouble. I learned about the Highland Wildcat from M.C. Beaton’s Hamish Macbeth novels. In the new building we have an open plan workspace so there’s no more cube decorating for me. That’s okay. I felt quite lonely when I was enclosed in that cube. I think that most of my co-workers dislike the open plan. Studies show that it hinders productivity. For me, it’s an energy booster. I worked a fair amount of hours last week. I finished a blog post about personal digital archiving and started one on digital painting. I go to work with the mindset that I am a writer. Then I sit down and write. The topics I write about require some research, and I feel a little guilty when I’m searching the Web and not writing, but that’s part of the process. This week, I want to finish the latest blog post. I also want to learn something that I can make a video tutorial about. Those are my work goals. In my personal life, I want to write more in my real paper notebook. I think this will help to alleviate my depression and anxiety. I recently read yet another article about how journaling is a good way to deal with depression. I’ve got stuff I need to say that I don’t want to share with the world. Another personal goal is about food. I have to improve my diet. I eat vegetables most days, but I’m not getting anywhere near the recommended five per day. I think that I have to eat well so that MS doesn’t get the better of me. There are recipes I want to try, but the idea of going to the grocery store and getting the ingredients stops me. I considered trying Blue Apron, but it’s too expensive for my budget. What I think I can do is work with the food I have at home. That seems reasonable. They built a stairway on that hill to make it easier for you to ascend and descend. Why are you trudging up in the grass and the dirt? Do you enjoy struggling? Are you trying to prove to everyone that you’re tough? I ask these questions because I care about you. I think you’re afraid that if something is too easy it means you didn’t work hard enough to make it happen. The fact is, you’ve got some natural talent in your DNA. There are some things that you were just born to do. You’ll breeze through a lot of projects and end up with something that’s good, or maybe a little above average.